The barber-surgeon’s pole (barber pole) actually originated from the rod that the poor patient grasped in order to make their veins bulge – this made it easier to cut or slice open. The brass ball at the top represented the basin that was used to collect the blood. The red and white stripes symbolized the blood soaked bandages, which would be washed then hung to dry on the rod outside the shop. The bandages would often twist in the wind, and this forms the spiral pattern we see on the barber poles of today. In the ‘dark-ages’ it was tradition for some monks to wear a hairstyle where the crown of the head is shaved, leaving just narrow ring of hair. Barbers were employed to manage this grooming, but also, because of papal prohibitions, they were also responsible for conducting surgeries. In fact barbers also helped regular people, providing surgeries such as setting breaks and amputating gangrenous limbs, lancing boils, and even letting out evil forces by drilling holes in people’s heads. These evil forces were thought to cause epilepsy and mental illness. 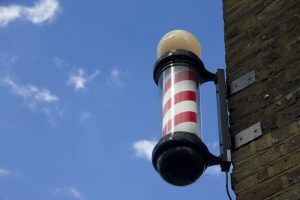 When the barber poles are spinning the red stripes are meant to move in a direction that makes the red (arterial blood) seem as if it is flowing downwards, as it does in the body.